West Windsor, N.J. – Despite temperatures that barely got out of the single digits on Jan. 31, Mercer County Community College (MCCC) students and staff, Fulton Bank staff, and members of the community came out to give blood during the American Red Cross Blood Drive (ARC), co-hosted by MCCC and Fulton Bank at the college’s West Windsor Campus. MCCC students stepped up in a big way, with approximately half the donations coming from the student body. 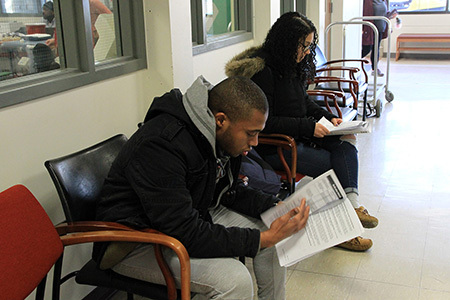 Business was brisk throughout the day, as many walk-ins arrived in addition to those with scheduled appointments. By day’s end, the drive had achieved its goal, with 40 registered donors and a collection of 38 productive units that included five double red cell procedures, the most frequently used blood component needed by almost every type of transfusion patient. 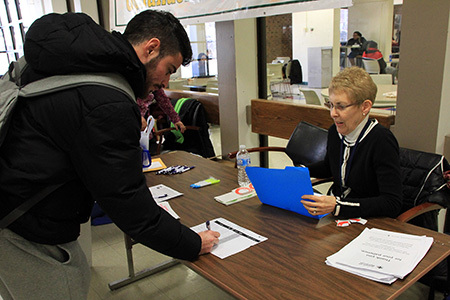 MCCC soccer player Eial Marzouk was among students who signed up throughout the day. 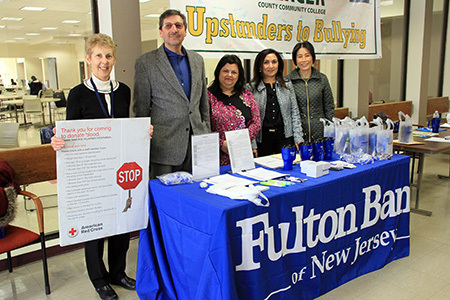 From left, ARC volutneer Susan Sumutka, MCCC Assistant Dean John Simone, Fulton Bank's Soni Sharma and Savita Lachman, and MCCC President Jianping Wang. Students review procedures and protocols before donating blood. 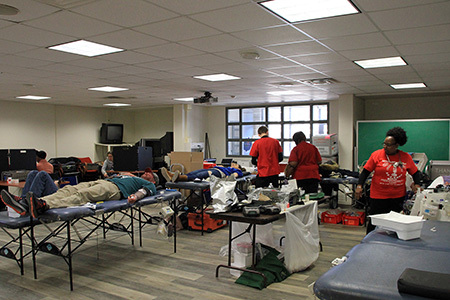 Room 104 in the Student Center became a blood donation room for a day.